Part Used & Method for Pharmaceutical Preparations: The foliated stems and branches are gathered in winter or spring, cut into pieces and dried in the sun. Functions: 1. To dispel wind and dampness; 2. To tonify the liver and kidney, and strengthen the tendons and combinations; 3. To calm the fetus and prevent miscarriage. 1. Wind-damp obstruction syndrome manifested as rheumatic pain and soreness and pain of the lower back and knees. 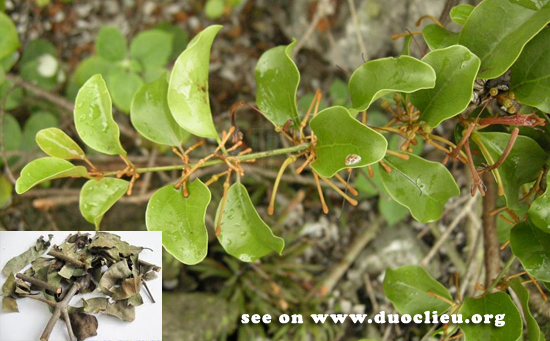 Mulberry mistletoe (Sangjisheng) is used with Pubescent angelica root (Duhuo), Cyathula root (Niuxi), Eucommia bark (Duzhong) and Cibot rhizome (Gouji) in the formula Duhuo Jisheng Tang. 2. Restless fetus, threatened abortion caused by deficient liver and kidney and dysfunction of Chong and Ren meridians. Mulberry mistletoe (Sangjisheng) is used with Mugwort leaf (Aiye), Donkey hide gelatin (Ejiao), Eucommia bark (Duzhong) and Teasel root (Xuduan). 3. Hypertension. Mulberry mistletoe (Sangjisheng) is used with Uncaria stem (Gouteng), Chrysanthemum flower (Juhua), Wolfberry fruit (Gouqizi) and Glorybower leaf (Chouwutong). 4. For abnormal uterine bleeding, excessive menstrual flow, uterine bleeding during pregnancy and threatened abortion, Ramulus Taxilli Chinensis is used with Folium Artemisiae Augyi (Ai Ye), Colla Corii Asini (A Jiao), Cortex Eucommiae Ulmoidis (Du Zhong), and Radix Dipsaci (Xu Duan). Dosage: 10-20 g, decocted in water for an oral dose.